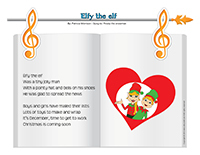 Welcome the Christmas elves into your daycare with this theme. Finger puppets, color by number, Advent calendar, photo booth, word flashcards, activity sheet, games, and so much more! (Open thematic poster-Elves) Print, laminate, and display all kinds of posters. 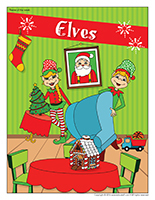 (Open educa-decorate-Elves) Print, cut out, and laminate. Use the items to decorate the walls of your daycare and set the mood for the theme. (Open models-Elves) Print. Let children decorate the garland. Cut it out and hang it within your daycare or near your daycare entrance. 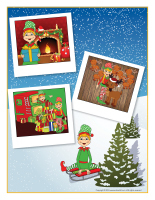 (Open educa-theme-Elves) Print and laminate the items that represent the theme. Use them to present the theme to your group (and parents) while decorating your daycare. 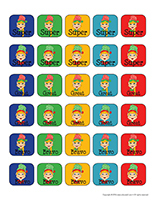 (Open stickers-Elves) Print the illustrations on adhesive paper. 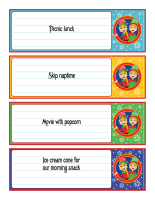 Cut out the items and use the stickers to reward children. (Open Advent calendar-Elf adventures) Print and assemble the various parts. Display the calendar on a wall. Children can take turns coloring or displaying the picture of the day. (Open schedule-Elves) Print and laminate. Use the schedule to display your planned activities. 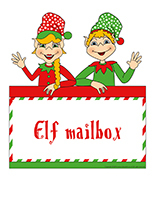 (Open poster-Elf mailbox) (Open elf memos and stamps) Prepare a special elf-themed mailbox. You can deposit messages and surprises from the Christmas elves in your mailbox throughout the theme. Use a cardboard box (shoebox, cereal box, etc.) and decorate it for your theme. Use an empty metal or plastic coffee can and transform it to make it look like a special mailbox. Hang a gift bag on a hook or door handle and identify it as your elf mailbox. 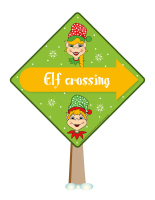 (Open elf crossing) (Open elf door) For these documents, print the color or black and white version. Display a poster in your daycare window too (facing outwards). (Open elf surprise notes) Print and write a short message on each envelope. Hide the surprise notes from the elves throughout your daycare and in children's personal belongings. Every time a child discovers an envelope, invite your group to gather around him/her to discover the surprise. This special tool was created in response to a special request received. 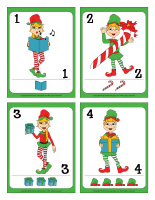 (Open group identification-Educatall elves) Print and laminate the various documents. Display them throughout your daycare and use the items to identify children's belongings and spaces. Every morning, hide an elf within your daycare. Avoid hiding the elf completely out of sight, but finding it must represent a challenge for the children in your group. When they find the elf, quickly take a picture of the elf. Print the pictures and display them on a wall near your daycare entrance each day. Children will love sharing where the elf was hiding with their parents. Wear an elf hat to welcome children in the morning. (Open picture game-Elves) Print and laminate the illustrations in the format you prefer. Use them to spark a conversation with your group. Ask children questions about elves. Do you know any stories about elves? Have you ever seen an elf? 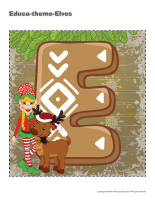 (Open picture game-Elves) Use the pictures to decorate your daycare or to spark a conversation with your group. Print, laminate, and store the pictures in a Ziploc bag or in your thematic bin. 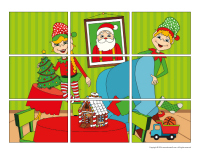 (Open picture game-Elves) Print the pictures twice and use them for a traditional memory game. (Open activity sheets-Elves) Print and follow instructions. 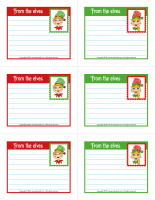 (Open writing activities-E like elf) Print for each child or laminate for use with a dry-erase marker. (Open posters-workshops-Elves) Print and display the posters to identify your various elf-themed workshops. Provide empty toilet paper rolls and cardboard boxes your little elves can use to build and imagine various types of toys. Make only red, white, and green blocks available. Create a carpet of snow in your area using a roll of cotton batting. If you have an old Christmas village (made of cardboard), children will love assembling it. Use papier-maché to build snowy mountains. Add gifts in different sizes. Cover the floor with Christmas-coloured felt squares. Use empty wrapping paper rolls to create tunnels, they can be decorated in your arts & crafts area. Elf-themed color by number activities. Count crayons with your little elves! Educatall creative coloring page or one you've created. Pre-cut shapes that must be assembled according to a specific series of instructions. For example, ask children to use a red circle, two yellow triangles, five green squares, etc. Transform your area to make it look like the elves' workshop. Offer wrapping paper, bows, ribbon, tiny boxes that can be decorated, glitter, and other accessories. Transform your area to represent the elves' workshop. The elves' cafeteria: items used to bake pies, cookies, and cakes along with homemade modeling dough children can use to represent dough. Santa's village/The elves' workshop: set up your workbench and encourage children to use plastic toy tools to fix and build toys of all kinds. Elves: hats, ears, elf shoes, tights, colourful Christmas socks, bracelets and necklaces with tiny bells, etc. Santa: Santa hat, a beard, black boots, a belt, and red clothing items. Reindeer: Dollar store headband with antlers, red makeup pencils or clown nose. Green, red, or white modeling dough with Christmas-themed cookie cutters. 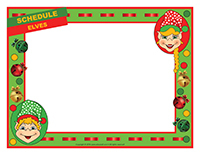 A magnetic board (or a cookie sheet) with elf or Christmas magnets. A bin filled with green and red pasta or rice in which you hide tiny objects (ornaments, figurines, bows, etc.). Children can sort them by color, by size, by shape, etc. Elf-themed illustrations to help children visualize elves of all kinds. Storybooks about Christmas and winter. Christmas music and book and CD sets about Christmas. 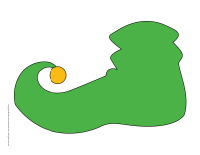 Connect the dots activities to draw elves. Christmas-themed storybooks, Christmas catalogues, Christmas stuffed animals and puppets. Tracing and maze games about the North Pole. Stationery and special crayons to write to Santa. 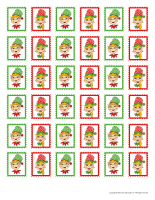 Christmas stickers (used as stamps). Use the flashcards to spark a conversation with your group or in your reading and writing area. They may also be used to identify your thematic bins. (Open word flashcards-Elves) (Open giant word flashcards-Elves) Print. 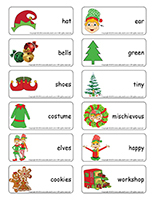 (Open word flashcards-Elves) Print and laminate the word flashcards. Have each child pick a word flashcard. They can take turns presenting their word to the group (ex. cookies). As a group, discuss each word. Ask children questions to encourage them to speak. (Open giant word flashcards-Elves) Print, laminate, and display the word flashcards on a wall in your circle time area or on a large piece of cardboard that can be moved around within your daycare. Name a word and ask a child to identify it. (Open transition games-Elves) Print several copies. Use the illustrations to create a path that leads to the areas within your daycare children visit most throughout the day (cloakroom, bathroom, table, etc.). (Open transition games-Elves) Print two copies. Laminate and cut out the cards. Glue one copy of each card on the table using adhesive paper. Drop the other copies in a bag. Children take turns picking a card to determine their spot at the table for the day. You may also use the cards to determine naptime spots or for your task train. Arrange elf illustrations on the floor and invite children to hop from one to the next in a variety of different ways: on one foot, on two feet, etc. to work on their gross motor skills. Use colourful adhesive tape to trace a giant hopscotch design on the ground. You could, for example, draw it between two rooms or areas children regularly visit during the day. They will enjoy hopping from one area to the next, alternating hops on one foot and hops on two feet. (Open playing cards-Elves) Print and laminate. Give each child the same number of cards. They can take turns hiding their cards within the daycare. Once everyone has had the chance to hide their cards, the hunt begins! Who will find the most elves? 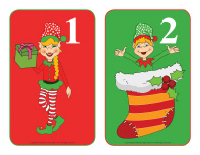 (Open playing cards-Elves) Print and laminate several playing cards and hide them throughout your daycare or yard. Divide your group into two teams. When you give the signal, children must try to find as many cards as possible in a predetermined period of time, for example 3 minutes. (Open miniature elves) Print and laminate. Hide the elves within your daycare and invite children to search for them. The child who finds the most elves can hide them for the next round. (Open models-Elves) Print, color, and laminate the models before gluing them on magnetic sheets. Set the elf magnets on a table along with a cookie sheet. 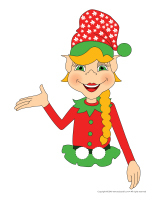 Children will enjoy sticking the elves on the cookie sheet and creating scenes and stories. Children hold hands. They must follow the first elf's rhythm. The first child in line can alternate between walking very heavily, on tiptoe, taking giant steps, baby steps, etc. Collect several elf pictures and illustrations. Glue them on different items throughout your daycare. Use the walls, cupboards, and even the floor. 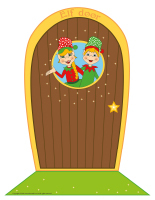 Children will discover the elves as they move about during the day. Pick a child who will be the elf. The elf chases the other children. When he touches a child, he/she becomes the elf. 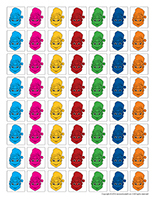 (Open color by number-Elves) Print for each child. Children must color the picture according to the color code. (Open educ-big and small-Elves) Print and laminate. Children must place the items in the correct order, from smallest to biggest. (Open educ-puzzles-Elves) Print, laminate, and cut out the pieces. Children deposit each puzzle piece in the correct rectangle to complete the scene. 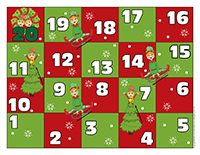 (Open snakes and ladders-Elves) Print and laminate. You will need a die plus a Christmas candy piece for each child. The candy pieces will be used as playing pieces. The goal of the game is for each child to reach the end of the board. When they succeed, they may eat their candy. (Open assemble the elves) Print and laminate. Cut each illustration into three parts (head, body, legs). Mix all the pieces. Invite children to assemble the elves as they wish. (Open educ-pairs-Elves) Print. Children must color identical items using the same color or draw a line between them. For durable, eco-friendly use, laminate for use with a dry-erase marker. (Open photo booth-Elves) Print the various accessories, cut them out, and glue a drinking straw behind each one. Visit your local dollar store to find silly hats, headbands, scarves, glasses, etc. to complete your photo booth. Set up a special corner within your daycare by hanging a large piece of cardboard, a curtain, or an elf-themed décor and have fun taking pictures of the children in your group. Simply let them use the accessories to pose for you. If you wish, invite parents to visit your photo booth. You can photograph everyone individually or with family members. Print the pictures and display them on a special wall for everyone to see. Encourage children to pretend they are elves. They can fix and wrap toys or even build and create new toys using recycled materials. To complete this activity, invite children to act out different types of toys created by elves (fire truck, doll, stuffed dog, etc.). (Open dress-up dolls-The elves' workshop) Print and laminate. Set the pieces on a table and let children dress the doll as they wish. 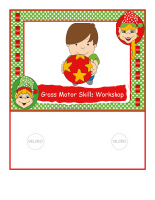 (Open transition games-Elves) Print, laminate, and secure the illustrations on the floor of your daycare. To the sound of music, children walk or dance around the daycare. When the music stops, they must quickly find an elf illustration to stand on. Play music and invite children to dance around the daycare. You are Santa Claus. Every time you touch a child with a magic wand, they become elves. Elves must remain perfectly still until you touch them once again. Set several hula hoops on the floor. Invite your little elves to walk or dance around the hula hoops to the sound of Christmas music. When the music stops, each little elf must find a home (hula hoop). Remove a hula hoop after every round, just like in musical chairs. Variation for younger children: Simply let children hop from one hula hoop to the next. Hold babies in your arms and hop with them. Give each child an elf hat to wear as well as a long piece of a party streamer to represent a scarf. Use red makeup to paint their cheeks and the tip of their nose. Provide musical instruments and parade around your neighbourhood. Don't forget to take pictures! Variation for younger children: They will be content with an elf hat and a red dot on the tip of their nose. Sing Christmas songs or play musical instruments. (Open mandalas-Elves) Print for each child. Encourage children to color the mandalas to help them calm down or relax during the day. (Open models-Elves) Print the various models and use them for various projects and activities during the theme. 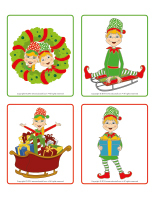 (Open educa-decorate-Elves) Print and cut out. Glue the shapes on a construction paper headband to create a hat for each child. (Open finger puppets-Elves) Print the models on heavy paper. Have children cut them out and help them cut the holes for the fingers. Show them how they can insert their fingers to move the puppets. (Open masks-Elves) Print for each child. Deposit crayons, glue, and glitter on the table. Let children decorate their mask as they wish. (Open photo album-Elves) Print, laminate, and use ribbon or metal rings to join the pages together to create an album. If you prefer, simply use pictures and illustrations of elves found here and there (flyers, catalogues, magazines, etc.) to create an album. Simply glue them on 10 cm x 13 cm pieces of paper and insert them back to back in sandwich Ziploc bags. Staple the bags together at the closed end to complete your album. (Open coloring pages theme-Elves) Print as many copies as you wish. Set them on a table and let children color the ones they prefer during free play.